Agricola Redesign | Tablescape Ideas for Easter! Easter is Sunday and if you haven’t started the planning process then you better get to it! For us, one of the most exciting parts about hosting this holiday family dinner is creating a beautiful tablescape! 1. Recycle mason jars and fill them with fresh flowers straight from your own garden! 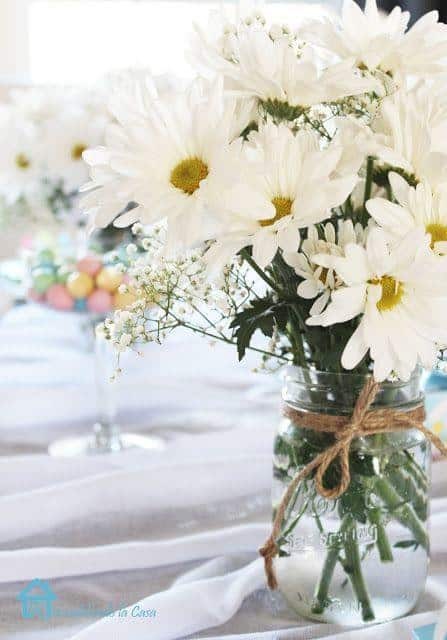 The look of mason jars its spring-ish enough itself, but adding in pretty flowers like daffodils will give you that added look! 2. Potted grass and stones are the perfect way to add natural elements to your Easter table design. Easter decor is all about pastel colors and nature, so why not incorporate that into your tablescape look? When you include the potted grass and stones with the flowers you’ll find that the looks complement each other quite well! 3. When we’re starting a tablescape design, we like to always start with a runner! It gives you design a base and then you can add layers on top of it to build up your display. After you find a great runner – either a pastel color, a simple white, or even a burlap runner – add a large tray to the center to help you with the beginning stages of building out the look. From there you can add your mason jars, flowers, stones, and other Easter table decor! As you’re preparing for Easter dinner, stop by A Village Gift Shop at 3 Village Square in Glendale to pick up your decor! We have trays, decorative plates, and anything else you need to make your table the prettiest one yet! Learn more at www.agricolaredesign.com or www.avillagegift.com.